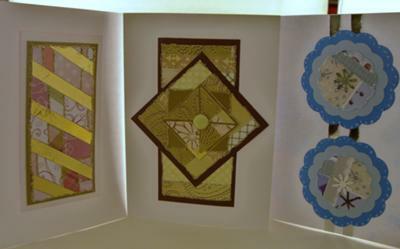 Three cards are made from scraps. I am in to glassfusing and beading mostly, but some times those who bought a necklace or a glass bowl as a gift, wanted to have a handmade card to go with the gift. I started to learn allover the internet how to make nice cards, and then I was stuck! It is so much fun to create a card for someone special or just because I want to try some new technique. Like in my glassfusing I do not like to make series of similar things. I want everything to be original. If you want a card that is printed in thousands, you can find them in nearest shop, easy, quite cheap BUT how much fun is it to give to someone? Everyone likes to have a handmade card, most people keep them as a memory. In card-making-magic I have learned how to make flowers and it all ended up quite well I think..
Another inventive way to use up your scraps of card or paper. All you need are some pretty papers and your imagination. These are suitable for any occasion and how well they would go with a gift or glass or beads. 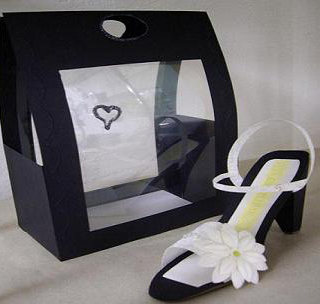 The shoe is wonderful and every woman would be delighted to recieve this. 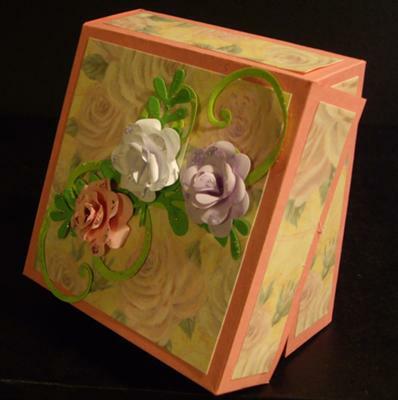 If you want to make flowers to adorn your boxes then take a look in the Video Tutorials for some ideas on different kinds. They are all easy to do and you will find the link in the NavBar to your left. My First Quad Easel Card. Saw Christinas tutorial and decided to give it a try. It was just for the fun of making it, not for any special occasion. The photos are taken in the evening and got a sort of yellow tone over it all. Next time I try mirricard and textured expensive white cardstock I think. My son is invited to a wedding and might need a card. The Quad Easel Card has been such a hit and I am delighted with the reception of it. Many of you have given it a try and sent me emails about your attempts. This one is lovely and it is good to see it from different angles. 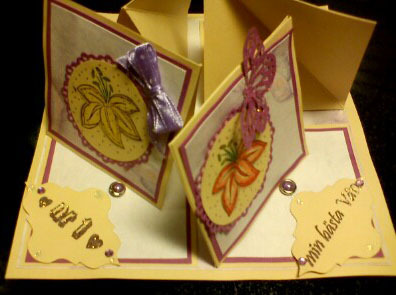 It is easy to do but is sure to get comments from the people who will recieve one of these cards from you. You will find video instructions on how to make this in the Tutorials section in the NavBar to your left. 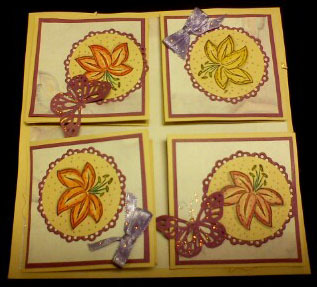 And don't forget the other variations of Easel cards too.